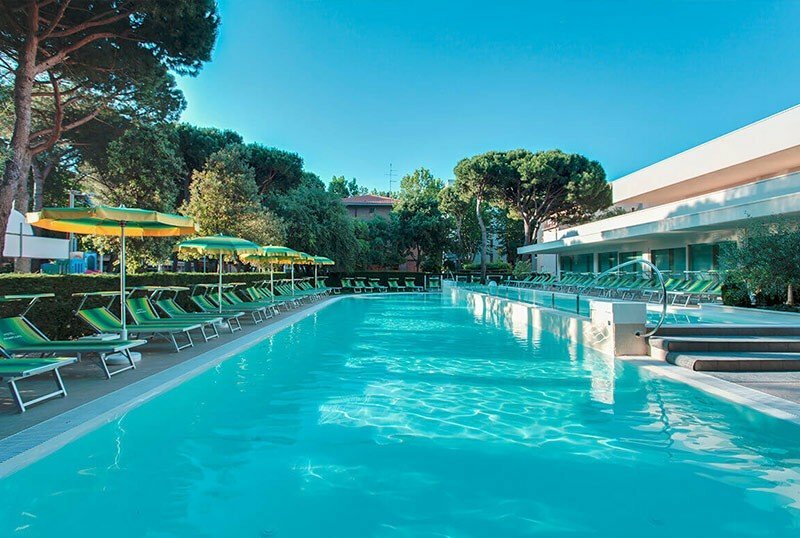 H otel Amarcord, 3-star hotel in Pinarella di Cervia, is characterized by a large swimming pool with sun terrace surrounded by a large wooded park with games for children. It has parking, entertainment for adults and children, WI-FI, allows you to choose whether to stay in hotel or appart-hotel. Pets are not allowed. The hotel is located in Pinarella di Cervia in a quiet and green area near the pine grove. To reach the beach it is sufficient a walk of about 5 minutes on foot. The rooms have a balcony, air conditioning, safe, telephone, fridge, 32 "flat screen TV, WI-FI, electric shutter, bathroom with shower and hairdryer, key card opening. AMARCORD: can be single, double, triple or quadruple. PRESTIGE: balcony and larger bathroom, refined furnishings. COMMUNICANTS: they can be Amarcord (4 people) or Prestige (6 people); if there are 6 occupants, the beach service includes two beach beach umbrella and 4 sunbeds. The property has a swimming pool, jacuzzi, garden, open-air porch, terrace, sun terrace, free bicycles, elevator. The pool is surrounded by a large wooded park with games for children, which also have an indoor playground area and an entertainment staff. Theme and dancing evenings are organized. PARKING: uncovered and free subject to availability. Free garage subject to availability, not bookable. CONVENTIONS: beach, amusement parks, Inail. BREAKFAST: buffet with coffee drinks at the moment. LUNCH AND DINNER: 3 choice menu, buffet of appetizers and vegetables, desserts, fresh fruit and ice cream. Water and wine are included. In hotel: swimming pool for children, baby / mini / junior club, live entertainment, playground area (indoor and outdoor), strollers, seggilolini for the bike, baby sitter and pediatrician (both on request and for a fee). At meals: baby menu, baby food, baby food, high chairs at the table, placemats, bibs, bottle warmers, early access to the restaurant, fresh milk for breakfast and before bed, afternoon snack. On the beach: live entertainment, playground area with inflatables. The apartments are located in an adjacent building, overlooking the hotel's garden. The entrance to the common services (swimming pool, parking, restaurant) is guaranteed, as well as full board, playground, mini club, bicycles, linen service and daily cleaning of the apartment. You can choose between two-room apartment (with a bedroom for 4 people, living area, kitchenette, TV, safe, private entrance and services) or three-room apartment (with 2 bedrooms, 2 balconies and all the services of the two-room apartment). In the large garden of the structure there is a swimming pool with two lanes, one for adults and one for children. In the pool there are hydromassage jets and the surrounding solarium area is equipped with sun loungers and parasols. 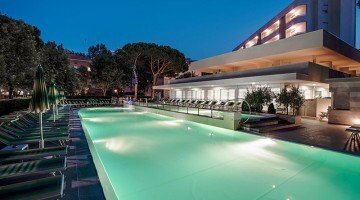 The hotel has an agreement with the Amarcord 125 Bath with relaxation area and restaurant, sports fields (beach tennis, beach volleyball, table tennis), playground area for children with inflatables. Prices are per day (or weekly where indicated) per family for stays of a minimum of 7 days in an All Inclusive formula. STAY TAX: € 1.50 per person per day in (June, July, August), € 1.00 in (April, May, September), including children under 14, for stays up to 7 consecutive nights. - A guest in an already occupied room: b & b for € 35. - Half board: reduction of € 3 per day per adult and € 1.50 per day per child. - Extra meal € 30 including water and wine. - The stay always begins with lunch on the day of arrival and ends with breakfast on the day of departure. - Meals not consumed will not be deducted from the account and can not be received on the day of departure, except as a travel basket. - For periods of less than 3 days, the a la carte prices apply. - Even for the apartments, the 'All Inclusive' formula includes daily cleaning, daily change of towels and mid-week bed linen. - The cleaning of the cooking area, if used, is to be paid by the customer. - Umbrella and sunbeds, included in the quotations, are assigned on the day of arrival by the beach manager at its discretion. In any case, the first 4 rows close to the water are excluded. For those interested in these positions it is necessary to check availability and to agree the extra quote with the beach manager. - Beach umbrellas and sunbeds on the beach are never included on the day of departure from the hotel, even if the client has not used them during their stay. Their possible use and payment must be agreed directly with the beach manager. - Hotel bikes are always free but not exclusive. - The cost of each overnight stay is included in a range from € 150 to € 180 depending on the room and / or occupied apartment and the number of people present. - In case of cancellation by the customer the deposit will not be returned. - Telephone or e-mail booking must always be confirmed by a deposit of € 300/500 for each week booked, sent within 10 days and necessarily followed by our written confirmation. - The car parked inside the Hotel, apartments and underground garage area must be removed by 10.00 am on the day of departure. Hotel Amarcord 4th Hotel in Italy for families! Come and spend 3 days at the beach ... Kites fly on the beach! Super family offer, come to the sea! full board, drinks at meals and beach included. Super affordable family packages for 4 - 5 and 6 days too!